"What's my workout for today?" I ask my sunglasses. "You're going two miles on the flat," they respond. The man walking by shoots me an odd look; other than the earphones, there are no obvious signs I have any technology on me at all. For a short moment I feel silly, but this is exactly what hearable technology should be: discreet, comfortable, human. We've seen some intriguing developments in hearables this year, and Oakley's Radar Pace arrives at an interesting time for the category. It's also one of the most impressive hearable devices we've used, in regards to both its artificial intelligence and its abilities as a fitness coach. You might be wondering why I'm not referring to them as smartglasses. While they are technically glasses, you won't be seeing anything on the lenses. It's all about using your ears – and your voice, of course. 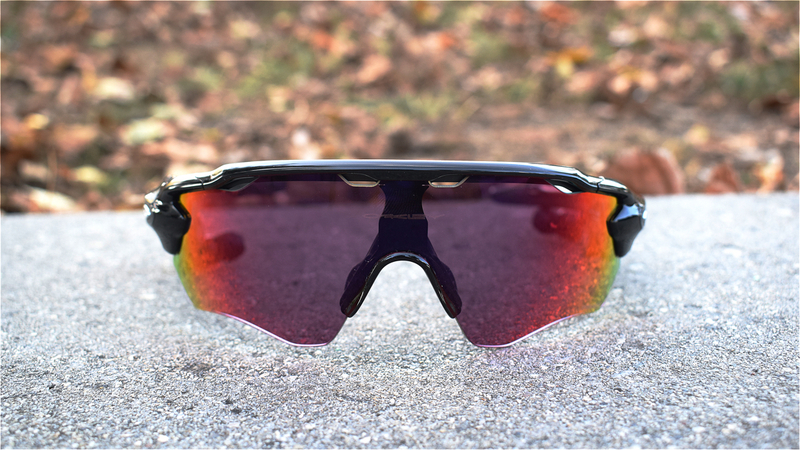 When I first picked up the Radar Pace glasses I was surprised by how light they were. Really, they're barely heavier than a pair of normal sunglasses, and they don't look much different. The Radar Pace was based on Oakley's existing Radarlock glasses, and when the earbuds aren't attached, any onlooker would be hard pushed to tell the difference. They're also very comfortable, with nosepads preventing any rub, and Oakley's three-point fit system never causing any pinching or stress on the ears. The glasses come with reflective lenses in the frame, but you'll also get some clear lenses in the case that can be swapped out for low-light conditions. To get talking with the coach you'll need to attach the earphones that connect to each side of the frame, just above the ear, through the micro USB ports. The earpieces have a couple of hinges, giving them some maneuvering room so you can get them comfortably into your ears. Speaking of ears, you also get a wind guard in the case, which you'll want to use if you're cycling at 20mph or more. It will help the mic hear your voice more clearly. That attaches to the side of the temple, where you'll also find a touch pad that lets you control music and incoming calls with different swipe and tap commands. You can also activate Siri or Google Now with a long press, although I haven't found myself using either much so far. Getting the glasses working with the app is an important stage of the process: it's here that you'll not only punch in your biometrics but will also tell Radar what you actually want to get out of your time together. The Pace is designed for all levels of fitness, from casual freerunning to marathon training, and you'll need to tell it what kind of workout you're looking for. I'm in the "just get in better shape" phase of my fitness plan, so I was glad to find a program that would help me do just that. Or, if you're aiming for a marathon in a few months time, you can tell it when the big day is and set up a plan to work towards it. You then tell Pace how often you'd like to run and on what days you'd prefer to do so. It then takes this information and chalk up a schedule for the next few days/weeks/months. For me, I'm looking for a plan that will get me fit, but not to marathon levels. During setup I was able to choose how often I could manage working out each week at my current fitness, and what days work best for me. The Pace then created a calendar showing which workouts I'd be doing on which days. Some weeks would be focusing on building, others on recovery, and on each day I'd have a target distance, sometimes including hill climbs. The Pace follows your progress over time and keeps everything updated in your diary log, which lives in the app. If you miss a planned run, Pace will know and adjust your overall schedule accordingly. For example, one day I missed a scheduled run, and so it booked me in for a more thorough workout later in the week. But where Pace is most effective is in applying this information in the moment. The Radar Pace outdoes most of the competition in two ways: it's dynamic, adjusting to your schedule and adapting when plans fall apart; and it provides information in real time, much like a human coach would. The idea is that your training is a two-way conversation between you and the Pace. You can ask it about your progress at any time, and questions usually have to start with an "Okay, Radar" – although I sometimes found this wasn't necessary. You can then ask it things like "What's my heart rate? ", "How's my speed?" and so on, and Pace responds with the data. Even at times when I wouldn't ask it anything, the voice would chip in with updates on my power, stride etc. It will also tell you if you're not doing something quite right. "Your stride rate is low," is something I became used to hearing a lot, quickly learning that I was hovering around 80 too often and needed to push it up to at least 88 for optimal performance. Pace guides you on making these improvements in the moment – smaller, quicker steps in my case – which is the kind of information you'd expect from a real fitness coach. It's valuable information that most fitness trackers don't provide, or at least not until after the fact. You will, however, need to have your phone paired with the Pace in order to do anything. There's no heart rate monitor included in the headset; instead you're expected to pair your own. It seems odd for any fitness wearable these days to skip a HR monitor, but then Oakley's decision means you can use something that's probably going to be more substantial. You can pair most Bluetooth and ANT+ sensors including power meters, cadence and speed sensors, says Oakley, although there were some, like the Apple Watch, that wouldn't connect. Still, the Pace is loaded with plenty of sensors of its own, including an accelerometer, gyroscope, barometer, humidity and proximity sensors. It detects elevation accurately, and some of the runs in my schedule involved climbing hills. However, when I was on an incline that was too steep for building strength effectively, Pace would tell me to find something a little more level. A little annoying is the fact you can't pause on command, it will only do so automatically. I only found this to be an issue because it would often take a few extra seconds to work out if I'd stopped. It's a small niggle that becomes slightly more irritating when running in busy areas where there's a bit more stop-starting. I also had some connectivity problems with my iPhone, with sound occasionally cutting out, and on a couple of occasions the connection was lost entirely. However this seems to be down to iOS 10 right now more than the glasses themselves – I didn't have the same issues with an Android phone – and hopefully something that will be fixed via firmware updates soon. For someone like me who's just getting back on the more serious fitness trail, taking the complications out of it all is great. I'm used to looking at metrics like heart rate, pace and so forth, but having a voice tell me what it means for me, in real time, is incredibly valuable. I've talked a bit about the voice interaction with the Radar Pace coach, but I felt it deserved its own space in isolation from the fitness. Here we're really talking just about Intel's technology, which aims to be more conversational and contextual than other personal assistants, where chat can often be stilted. So for example, I'll ask Radar Pace "What's my heart rate?" It will then come back with an answer, to which I can follow up with a simple "Is that good?" The Pace is pretty proficient at recognising different words and flexible with syntax – within reason. So long as it picked up the key words, it tended to understand what I was asking. Sometimes I was so comfortable in conversation with the Pace that I'd be thrown when it didn't understand my requests, and that's where the illusion occasionally breaks down. When it hears you, the Pace works very well, but often I found myself having to repeat commands to get Pace to hear me. It's particularly tricky in a more urban area where other noises can interfere, and having to say the same thing at it more than once, often progressively louder, makes you a lot more self-aware. I also found Pace would sometimes pick up outside noises and try to process them, causing the music to dip and the recording tone to sound, before it decided to ignore it. Speaking of music, there's not much to say about this other than it works as you'd expect it to, with everything streaming from your phone. The music will fade into the background when Radar is talking to you, but you can't use your voice to control the tunes, only the touch pad on the side. The Radar Pace needs your smartphone to work, and your data and schedule live within the phone app. Pace is compatible with Apple HealthKit and Google Fit, but its brains lie in the app, which you'll be coming back to each time you use it (you can't pair the Radar Pace with third-party apps). Once you've set out your schedule you'll be able to see it any time under the 'plan' tab, showing how your workout will build over the coming days and weeks, as well as data on previous runs and training zones. This means you always know what your next target will be and, as I mentioned before, it will also adjust depending on your performance. Any sensors you've tied via Bluetooth will also feed information into the app. My heart rate information was available to see on the graph along with other metrics captured by the glasses, along with a map of where I'd run, created by the phone's GPS. Again, this is another sensor to offload that, while keeping you tethered to your phone at all times, means the Pace's battery life is surprisingly good. The glasses take around three hours to charge, and I got between two and three hours of power between charges, with life varying depending on whether I was streaming music or not. Overall, I found the app to be a nice straightforward way of putting all my information into context, and I'm going to continue using the Pace throughout my workout schedule. I'll update this review when I get to the end of it in a few weeks and I can see just how far the Pace has helped me come along, but so far all signs are very good indeed. The Oakley Radar Pace glasses are very impressive, and surely the direction that fitness, and indeed hearables, should be going in. The more natural style of conversation with Intel's AI is pleasing, but it's in the fitness coaching where the Pace really stands out. The cost is high, but in return you get a fitness plan that's tailored just for you, and that's a very valuable thing.